Scientists used to think that temperature had nothing to do with how well our body fought off a rhinovirus like the common cold. Then they found out that they were wrong. And now they've found out why they were wrong. For a long time, everyone agreed with your grandmother - if your nose got cold, it's time to come inside. You'll catch a chill, and the only way to fight that off was to keep wrapped up and fill you with hot soup. Then, for a brief period, scientists believed that your grandmother was full of crap and that temperature had nothing to do with the proliferation of the common cold. We all got sicker in winter because we grouped together in buildings with other filthy humans. Well, granny is having her day. Not only has scientific consensus shifted back to temperature-dependent cold viruses, we at last know why the rhinovirus thrives in cool temperatures. 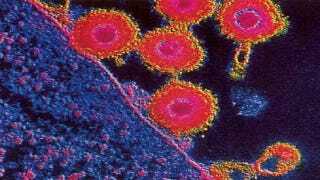 Scientists introduced a rhinovirus into mouse cells at two different temperatures, 33 °C and 37 °C. They found that at the lower temperature, rhinoviruses could multiply relatively freely. The virus wasn't powered by the cold, but at the cool temperatures the cell's immune response was weak. At 37°C the cell kicked into gear by expressing its IFN genes. These genes produce interferons, which do just what they sound like they do. When a cell is threatened, interferons increase the body's vigilance to outside infection. The immune system scans the detritus of cells looking for infection, and breaks down large foreign objects to see if they're up to no good. Interferons also kick macrophages into gear, causing them to enthusiastically eat whatever they think is an outside pathogen. This is why colds replicate so much more quickly in the relatively cool nose than in the warm lungs. They encounter less resistance to their infection in the nose, or in any cold area. So turn up the heat to fight off a cold.